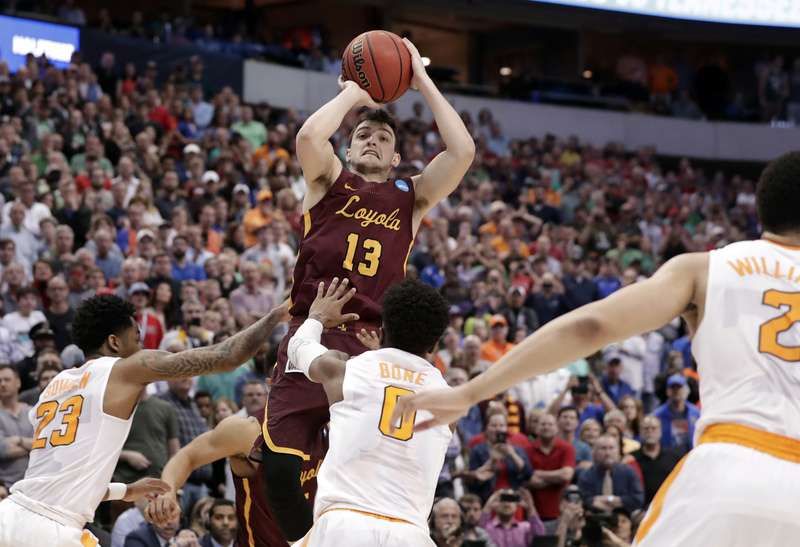 DALLAS (AP) — Porter Moser wants his Loyola-Chicago players to savor every moment of the NCAA Tournament. It took the Ramblers a long time, and last-moment shots in consecutive games, to go from what the coach termed a "grassroots rebuild" to the Sweet 16. "It's amazing when you have a group of people who believe," Moser said. "I mean, just this group is resilient. They believe." Maybe on this Sunday, when they returned home to Chicago from Dallas, they took the chance to catch their breath a bit — and say a prayer or two of thanks. "We knew we were having to win and win the conference and then get to the conference tournament, and it's been this mentality of you win, enjoy the moment," Moser said. "I'm letting them enjoy it because it's a mature, close group. And I want them to enjoy it. Then the next day, we all say put it in the bank, next one up." In 100 years of basketball at Loyola, a Catholic college in the heart of Chicago with about 16,000 students, no team has won more games than this year's Ramblers (30-5), the No. 11 seed in the South Region. "It just means the world to us to bring that pride back to this program," senior guard Ben Richardson said. They matched the 29 wins of their 1963 national championship team when Donte Ingram's last-moment 3-pointer beat Miami in the NCAA opener Thursday. They broke that mark two days later, when Clayton Custer's jumper got a friendly bounce off the rim with 3.6 seconds left for a win over Tennessee. "It just means our season is not over," senior Aundre Jackson said. "We've reached no finish line." Loyola plays in Atlanta on Thursday night against No. 7 seed Nevada, which had a huge rally Sunday night to beat No. 2 seed Cincinnati 75-73 . The Ramblers will get another pregame prayer from Sister Jean, their 98-year-old team chaplain who also provides her own scouting reports and notes of encouragement to the Ramblers. Jean Dolores Schmidt was in Dallas, and plans to be in Atlanta as well. Along with their national title, the Ramblers went to the Sweet 16 in their last NCAA Tournament appearance 33 years ago before Patrick Ewing and Georgetown beat them in the third round. But when Moser arrived in 2011, and endured a 7-23 debut season with only one win in the Horizon League, there was little interest in the program that would move to the Missouri Valley Conference two years later. Moser, an assistant coach for the late Rick Majerus at St. Louis before that, recalls only a couple hundred people at games, and his family walking through the student union with more people there than in the basketball arena. Still, Moser had a plan, one without shortcuts, to create a winning culture. "I'm blessed, so blessed that Loyola University, the administrators, the fan base, they were steadfast on how I was saying I was going to do it with good kids, good people. We weren't going to bend on the academic reputation," he said. "All our kids graduate. We've got high-character kids, and it was a credit to them. And in this day and age, because I know fan bases all over want it so fast." Time after time when speaking to groups and fans, the coach who is from the Chicago area repeatedly asked people to imagine Loyola getting back to the NCAA Tournament — and advancing. "I just kept on pounding that vision," Moser said. "It isn't just me. It is an absolute wide stretch of people at Loyola that has had that vision to do it the right way with a good foundation of great kids, great student-athletes." Everybody can surely see that now.